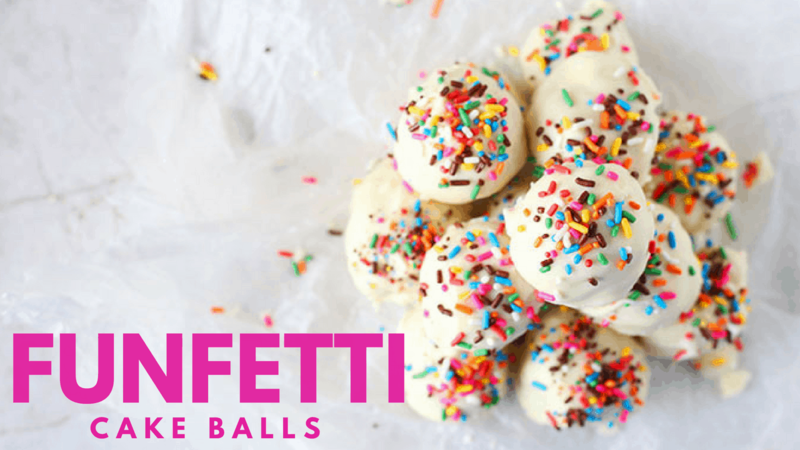 I wonder how many of you will make these Easy Funfetti Cake Balls over the weekend? These Easy Funfetti Cake Balls are magical! Okay, I don’t know what it is about the box mix Funfetti that makes it so addictive and delicious. Like seriously, I could make an entire sheet pan of Funfetti cake, cover it with the amazing icing, and eat the entire cake within 2 days and I am not joking. That is how good that cake is to me. When I am minding my own business and stalking other bloggers like Sally’s Baking Addiction and Cookies and Cups who have some amazing dessert recipes, I am always eyes glued to my computer screen when I see a recipe that is made with cake batter, or Funfetti anything. I think there is magic in sprinkles. First of all, sprinkles can make anything look pretty and everything looks fun! When I see something covered in sprinkles, I know it is going to be a good time and that I am in for a treat! So when I was in the kitchen, looking a box of Funfetti Cake Mix, I gave a lot of thought as to what else I could do with these besides making a Funfetti Sheet Cake, or Cake Mix Pancakes, or cupcakes. No, I wanted to play around with this $1 box of cake mix and give a new way to enjoy this cake. And theeeen…..
EUREKA! That is when the craziest thing came to my mind and I had to oblige. Here is a secret about me, whenever I do something sneaky or something that is wild (in my mind) I can’t stop laughing or smiling. It is a very weird and interesting quack I have. Yes, I am calling it a quack because if you saw me in the kitchen making these Easy Funfetti Cake Balls, you would call me a quack. It was like I was some sort of diabolical evil baker enjoying shredding the cake mix and watching it come apart. I remember thinking to myself, “Yo son, you are acting mad weird right now.” I just couldn’t help it. I was really excited about these cake balls and couldn’t wait for the final product. As I was in my mad kitchen taking the form of a mad baker, I decided to bake the cake as instructed on the box, shred it into crumbs, MIX IN THE ICING, combine together, and make little balls out of them. Like who does that?! Where did I come up with this idea?! I must’ve seen it somewhere and it must’ve stuck with me. I wish I could remember where I may have seen this technique, but I can’t. But yes yall, I baked a cake only to shred it apart, I added a canister of icing to the cake mix, made balls out of them, dipped them and white chocolate, and gave birth to these Easy Funfetti Cake Balls. If only giving birth to both of my sons were so easy. These Easy Funfetti Cake Balls are perfect for weddings, baby showers, or bridal showers. Like many of my recipes, these cake balls are totally adapted and leaves room for interpretation. If you don’t like Funfetti Cake Mix (you’re crazy if you don’t) then you can use any cake mix you prefer! You can do this same technique with Strawberry Cake Mix, Lemon Cake Mix, Chocolate Cake Mix, or even the Caramel Cake Mix! Go crazy, better yet, go MAD in the kitchen. Being a foodie is all about trying new things and taking risks. You can get these ingredients at your local grocery store for less than $5. Aren’t making these Easy Funfetti Cake Balls worth the risk? I mean, look at them! These Easy Funfetti Cake Balls are absolutley magic and easy to make! They are like one big bite of Funfetti Cake into a cake ball! You will love them! In a large bowl, mix the cake mix along with the water, oil, and eggs as instructed on the box. Mix well and pour into prepared baking dish. Bake in preheated oven for 20 minutes and allow the cake to cool completely. Once the cake has cooled, break the cake apart making course crumbs and turn into a large bowl. Add one full container and a fourth of a second container to the cake crumbs and mix until the cake forms into a ball. Line a baking sheet with parchment paper, using a cookie scoop, scoop the cake mix into a ball and roll to make smooth. Repeat until all cake mix is formed into a ball. Place in the freezer for, at least 1 hour or overnight. Melt the white chocolate coating, dip the balls into the white chocolate with a fork, shake off the excess and place back onto the parchment paper and immediately sprinkle with sprinkles. Repeat until all of the cake balls are coated and place in the refrigerator until ready to serve.